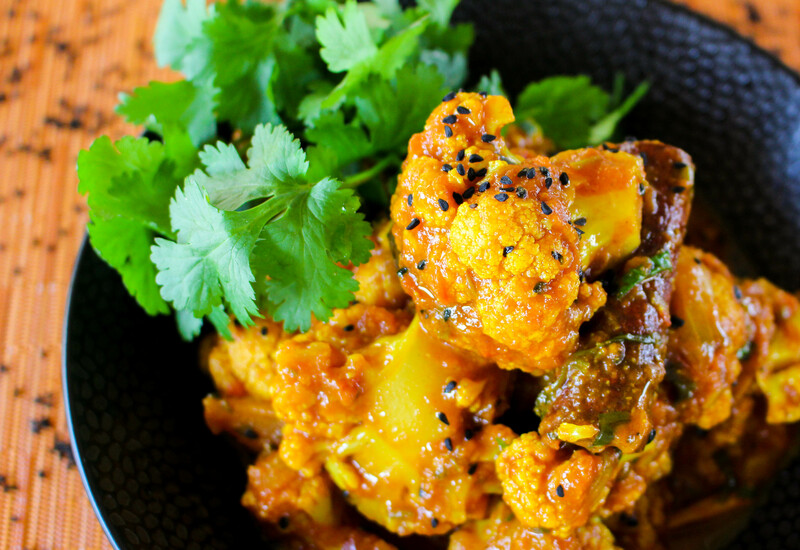 This curry was inspired by a cooking class I did with Julie Sahni (www.juliesahni.com) in New York a few years ago. I spent two full days cooking at her apartment in Brooklyn. She was an excellent teacher and a very welcoming host. This is my interpretation of her cauliflower curry. Take the cauliflower and cut off the florets, you want fairly large pieces as smaller florets with disintegrate during the cooking process. Place in a large mixing bowl and wash with cold water. Drain and then set aside. In a medium/large pan heat the oil then add the onion and the whole spices. Cook on a high heat to caramelise the onion then take the pan off the heat and add garlic, ginger, chilli and the remaining ground spices. Return the pan to a medium heat to cook out the curry paste for a minute or two, taking care not to burn the paste. Add the tomato paste and stir for a few seconds longer. Add the drained cauliflower to the pan with the curry paste and using a large metal spoon stir the cauliflower, coating it evenly with the paste. Add the tinned tomatoes then fill the empty tomato tin with cold water and add that to the pan. Add the stock cube, chopped coriander stalk and the vinegar, stir well then place a lid on the pan and simmer the cauliflower on a medium heat for about 20 minutes. 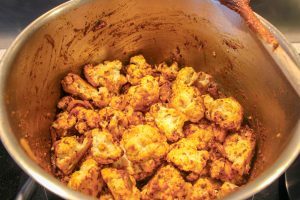 After 20 minutes, remove the lid and then cook for a further few minutes (15-20 for example), until most of the water has evaporated and the curry sauce clings to the cauliflower. When ready stir the fresh coriander leaves through and serve with some coconut rice.